Recently I was asked to model for one of my very favorite boutiques, Piper Street. I love all of their clothing, and personally fell in love with this gorgeous maxi dress. I love mixing prints and just had twirl in this one. Lets all just take a moment to stare and swoon over this gorgeous maxi. I love the high low flare to the skirt, the stripes meet floral, and the way it lays so flattering on my figure. Did I mention how soft it is? I could wear this dress all day! Now is your chance to win a $25 credit to Piper Street. See below for details. Trust me, you will love everything in their shop. Check it out! Ooohhh!!!! This skirt is gorgeous!! Love it with the striped top. Love our outfit! I think I should win the store credit because I just got a "big girl" job and need some new work clothes! Oooh I love this mix of prints! Stripes and florals are my favorite together. You look grogeous! 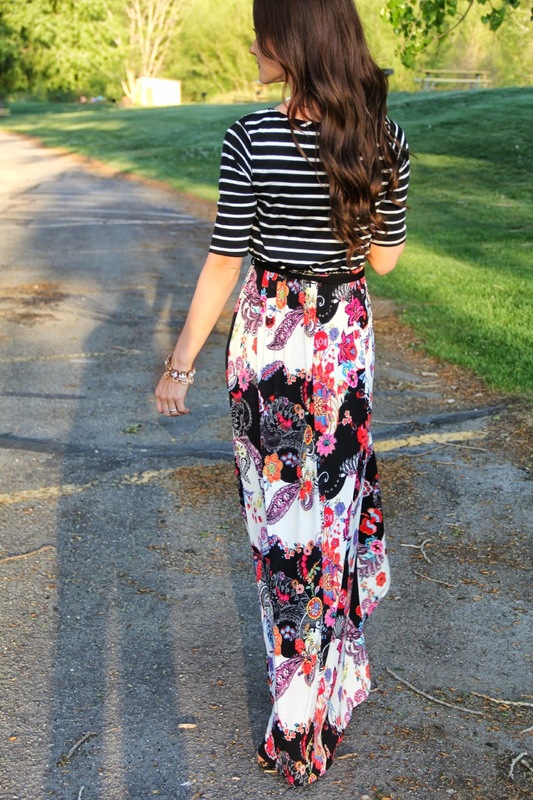 I love the mix of prints on this maxi dress. It almost looks like two pieces and I love it! Very pretty! Because I am in desperate need of sprucing up my closet! You look gorgeous. I love the florals with the stripes. Your hair is stunning. I would like mine to look that healthy on the ends. Visiting from Pleated Poppy WIWW! You look stunning, and I adore that dress!! I'm glad to be introduced to Piper Street – it's the first time I've heard of them, and I'm loving what I see there! <3! Love the Claire dress!! So cute! Because I'd like to give myself a treat for Mother's Day! I'd love to win so that I can have a few pieces from there. I'm in desperate need of some florals for the season. I'd love to win to get some stylish new looks for summer on my very limited budget! I pretty much live in maxi dresses in the summer! I never like when it's asked why I think I should win or why I deserve to win. I need, and I do mean need, clothing therefore it would most certainly be appreciated and considered a blessing. Loving the maxi dress and leopard heels!